Processing professionals who are looking to add Warren Rupp Versa-Matic filter regulators, Sandpiper Tranquilizer pump surge suppressors, or WEG motors to their facilities can always count on Arroyo Process Equipment. We have the best selection of high-quality products from these and other well-respected manufacturers in the industry. Our fluid handling equipment company has been serving the industry for a half of a century. Seasoned industry professionals know that we have the selection of pumps, motors and related processing equipment they require to keep their operations running smoothly and efficiently 365 days a year. Sandpiper and Blagdon Pump are two of Warren Rupp’s subsidiaries that manufacture filter regulators. Sandpiper manufactures reliable AODD pump regulators that feature maximum inlet pressures from 150 PSI to 175 PSI and regulating pressure ranges from 0 PSI to 125 PSI in port sizes from ¼” to 1”. Processing facility operators can control Blagdon BSP regulators independently of other processing equipment. 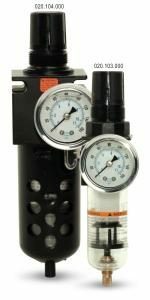 These regulators are compact units that combine the functionality of pressure regulators, filters and liquid-filled pressure gauges. The regulars, motors, dampeners, gearboxes and other products that we distribute are easy to install and typically require minimal ongoing service. The equipment experts and engineers at our Arroyo Process Equipment headquarters are always happy to provide processors in Georgia, Jamaica, Tobago, Virgin Islands and beyond with technical data, installation instructions, and more on the filter regulators, motors, and other processing equipment in our lines. If you need installation assistance or repair for new motors, gearboxes, pumps or any other processing equipment, one of our Authorized Distributors around the world can come to your facility. Contact us today to learn more.